Are you in a last-minute panic over how to prepare the Thanksgiving meal? We can't help you thaw out that frozen turkey in one hour, but we can direct you to some Roku channels that have plenty of other advice, recipes, and tips for a perfect holiday meal. Make Ahead Thanksgiving - Get a head start on your cooking with 12 recipes like Vegan Freezable Make Ahead Samosas, Pecan-crusted Yam Patties, and Betty's Angel Biscuits. Thanksgiving Starters and Sides - Thirty videos with multiple ways to make smashed potatoes, carrots, and dressing, plus new ideas that include Bundt Pan Cornbread Dressing and Deep Fried Deviled Eggs. Thanksgiving Turkey and Mains - Here are plenty of ways to cook the turkey - Grilled Spatchcock Turkey, Sous Vide Turkey Breast, Cajun Deep Fried Turkey, Buttermilk Brined Mustard Turkey, Butter-basted Roast Turkey... the list goes on and on. Thanksgiving Desserts and Drinks - These 36 videos are heavy on the pumpkin, with recipes like Butternut Pumpkin Pie, Pumpkin Coffee Cake with Buttery Pecan Streusel, and Betty's Cracked Top Caramel Pumpkin Pie, but you'll find pumpkin-free offerings s well. Drinks include Hot Spiced Apple Cider and - not to leave out the pumpkin options - Pumpkin Apple Fizz. TheFoodChannel has a small but interesting collection of 13 Thanksgiving recipes that include a traditional Roasted Turkey and Gravy and a Black Walnut Pumpkin Pie. Their Thanksgiving category also includes "90 Second" videos that include Thyme Cream Gravy and Mini Turkey Sliders. (90 seconds refers to the video length, NOT the length of time to prepare the dish!) There are also a few "tips" videos, such as How to Crimp Your Crust, and an interesting adult beverage made from the "perfect blend of rum and balsamic vinegar." If you want to add some Southern flair to your holiday meal, Southern Food will show you how to make Original Southern Cornbread-Sage Dressing, Slow Cooker Green Beans Seasoned with Ham, and Baked Smothered Turkey Wings. For dessert, try the Southern Sweet Potato Pie with Brown Butter and Southern Oatmeal Pie. Who says the holiday meal has to be created indoors? The Outdoor Cooking Channel features The New Holiday Outdoor Cooking with favorites like the Smo-fried Turkey, Twice Smoked Holiday Ham, Violated Beer Can Turkey, and - for your vegetarian guests who don't want a violated turkey - Beercan Vegan Turkey on a Big Green Egg. If you're doing an outdoor turkey, though, you might want to start with "Top 6 Turkey Techniques" for some inspiration. And there are also outdoor desserts like Dutch Apple Desert, Baked Mango Peach Buckle Pie, and "Four Easy Holiday Pie Recipes Cooked Outdoors." If you or any of your family or guests have gone keto, Low Carb 360 has several Thanksgiving recipes to keep you on track. Turkey is naturally low-carb so you can find those recipes elsewhere, but this channel shows you how to make sides of Low Carb Cranberry Sauce and Low Carb Mexican Corn Bread,, and provides dessert ideas that include Low Carb Pumpkin Pie and Mini Pumpkin Cheesecake. Don't overlook the liquid refreshments! Drinks will provide inspiration and instructions. Their Thanksgiving Recipes category nearly a dozen videos that include Spiced Pumpkin Fizz, Sparkling Caramel Candy Apple Punch, and Sparkling Thanksgiving Punch. Wine Oh TV ditched their Thanksgiving category for 2018, but you'll still find relevant videos that include "Creative Thanksgiving Recipes and Wine Pairings" and "Thanksgiving Wine Picks from Napa and Sonoma." Those are only a few ideas from the entire collection of 200+ Food channels on Roku. 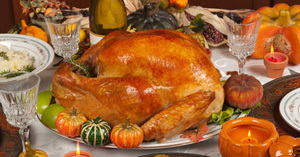 Happy Thanksgiving from RokuGuide.com! This article was previously published and has been updated to reflect current content for Thanksgiving 2018.